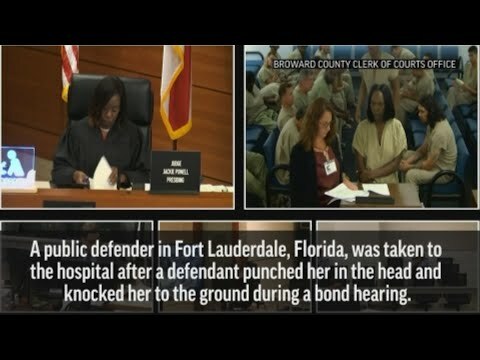 FORT LAUDERDALE, Fla. (AP) — A Florida sheriff says all inmates will now be handcuffed during bond hearings after a public defender was punched in the head. The lawyer’s boss calls that an overreaction, and blames the episode on deputies who failed to contain a clearly “psychotic” defendant. Broward County’s newly appointed Sheriff Gregory Tony said the blame lies with the public defender’s office, which he said created “lax security” by arguing against the routine handcuffing of defendants who are presumed innocent under law. “For our attorney to take the brunt of the failures of law enforcement ... is unacceptable,” Weeks told the Sun Sentinel . Public defenders have a tough enough job to do without having to worry about defending themselves in the courtroom, he added. Chase said in a statement Thursday that she had recognized years ago that the criminal justice system is poorly suited to deal with the needs of the mentally ill. Weeks said there is no indication Green knew either Chase or the other client. The video shows him sitting with other inmates, holding his chin in his left hand, before suddenly getting up and attacking the lawyer. He never should have been removed from a mental facility equipped to treat his conditions, Weeks said. “There was a big push to have officers trained to deal with crises, trained to identify folks with mental illnesses, trained to make better decisions about who they were going to arrest, and it seems like going into a hospital to arrest someone who is acting out in a psychotic state, consistent with their psychosis, only seems to transfer the issue to jail,” Weeks said.